The Live Action Lips of “Syncro-Vox”! 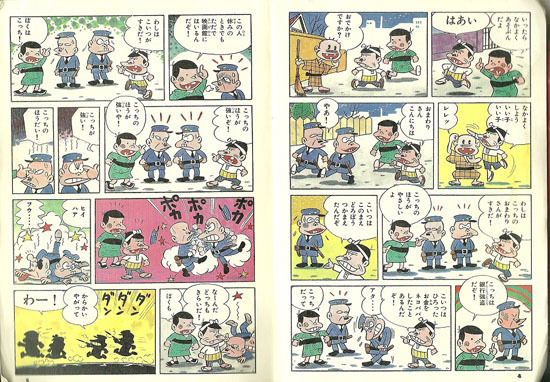 As I wrote earlier, Fujio Akatsuka pioneered the gag manga genre in Japan. He showed what it means to do a funny comic for the mainstream circulation, and he did it well. He has created numerous series that have went on to become hits, but none more than Tensai Bakabon. 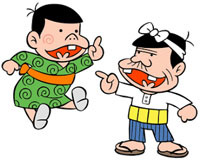 The Tensai Bakabon comic first appeared in 1967 in Weekly Shonen Magazine. It is about the misadventures of a boy named Bakabon and his insane father, who has no name other than “Bakabon’s Papa”. The name of the series is contradictory: “Tensai” means genius and “baka” in “Bakabon” means dumb, idiotic; in English speaking circles the series is sometimes referred to as “Bakabon the Idiot Genius”. Indeed, Bakabon is rather naïve and idiotic, and most of the humor in the series came from all sorts of stupid stuff that the two characters did, especially the father. The whole series serves as a way to point out common stupidity in the Japanese society, exaggerated up to 11 for comedy. 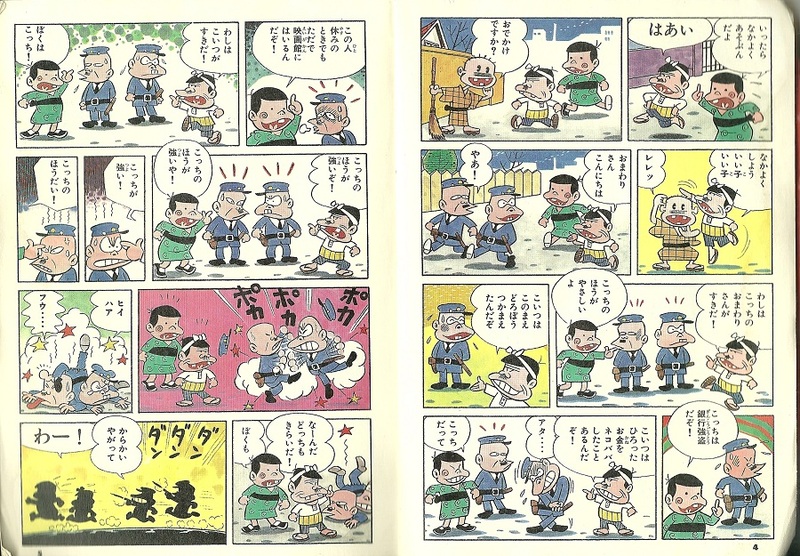 True to Fujio Akatsuka tradition, the secondary character quickly took over the spotlight. In this case, Bakabon’s Papa became the central character, and while Bakabon was still prominent, he was effectively a sidekick, serving as a foil to the insane, idiotic adventures that his father would get into. Even with the change, though, the characters’ stupidity has always been the focus. Papa, in fact, is a graduate of Bakada University (Idiot University), where he was highly regarded by his peers. Some of the later storylines feature Papa meeting up with his fellow students from the university, going on idiotic adventures together. Of course, with a set-up like that, the comic was a huge hit with the Japanese audience. So it’s no surprise that an anime would come out of this. In fact, Bakabon had four TV anime. The first anime, simply titled Tensai Bakabon, was produced by Tokyo Movie, with animation handled by A Production. 40 episodes were broadcast on Yomiuri Television from September 25, 1971 to June 24, 1972. Unfortunately, while Fujio’s insane sense of humor were allowed in print magazines, it was a different story with Japanese television, even if they allowed more content than what America’s Saturday Morning lineup would. Due to Yomiuri TV’s instance, Tokyo Movie was forced to tone down the source material’s content. Papa was still an idiot, but not that dangerously so like in the comic. He actually held a job as a tree pruner (in the comic, he never held a long-term job and the family’s source of income was never revealed). Bakabon’s school life was a plot point for several episodes, which, again, was something that the comic never explored. The comic’s non-sense humor is practically non-existent, and the show’s writer seemingly tried to make it so that everything made sense. In short, the TV series practically neutered everything. It’s no surprise that the show was a flop, having missed the point of what Fujio Akatsuka was trying to do when he created the comic. And Tokyo Movie was aware, too, because they decided they would give the series a second try, this time trying to be close to the source material. And they did. Tokyo Movie got another try few years later, this time called Ganso Tensai Bakabon; “Ganso” meaning “Original”, which should tell you everything you need to know about how this show is different from the 1971 series. In deed, in the very first episode, there was a short scene where a mysterious figure asks everyone who the real Bakabon’s Papa is, and various doppelgangers, including one that looks just like the version from the earlier show, all answered that he’s the real Papa. The figure says they’re all liars, because the real Bakabon’s Papa is him, in all of his moronic glory. One of the more famous episodes parodies the “gekiga” (gekiga is to manga as graphic novel is to comic book) movement. A gangster, drawn more realistically than the cartoonish Akatsuka characters, tries to claim Bakabon property as his. Bakabon’s Papa refuses to budge, so the gangster tries to kill him with his flute, which shoots out a bullet whenever he finishes a song. However, the song is really long, so Bakabon’s Papa easily escapes him because the criminal is never able to finish the song in time to actually get him. A storyline this insane would never work elsewhere except with Fujio Akatsuka’s settings. “Ganso” aired from October 6, 1975 to September 26, 1977 on Nippon Television, and they was more than willing to go farther than what Yomiuri did in terms of content. 103 episodes were made for this series. This is the regarded by fans as the true Bakabon anime, and indeed, the additional two TV series that followed (both produced by Studio Pierrot, one 1990 and another 2000) tried to mimic the standards that Ganso set, but the mid-1970s TMS series truly understood the source material the best, and set the standards for all gag anime that has come since then. Also had the coolest intro ever, with the moon crashing into the earth head-on! Incidentally, TMS tends to refer to their first two series in English as “Meet the Boneheads” for who knows why, but they do (I guess it sounded better over “Bakabon the Genius” or whatever). There seems to be a Spanish DVD release of the fourth series coupled with the 80’s Osomatsu-kun under the title Cosas De Locos. Here’s an episode from the third series I came across on YouTube that I really enjoyed. It’s weird the things that pass America by and Europe gets! Just love the fact the opening to this show has English credits anyway! When I was in Japan between 2002-2006, and one (the latter two, I believe) of the Bakabon series aired on Cartoon Network. I could never really get into it (wasn’t fluent in Japanese), but my sister enjoyed it, saying it’s her favorite anime. As I recall, Cartoon Network Japan aired all four “Bakabon” anime. Now I’m starting to wonder if Matt Groening stole the Simpsons template from this anime: idiot father, comparably idiotic son, more sensible mother, genius younger child. Regarding your comment, I don’t necessarily agree with it. I’m a HUGE fan of Bakabon and a LOT of things are different from Bakabon and Simpsons. The Simpsons’ origins trace them back to a waiting room in the Fox Studios where Groening was waiting to pitch his indie comic “Life in Hell” to the higher-ups, but felt that they would butcher his source material due to it being featured in a short-segment format on The Tracey Ullman Show. He doodles up a family on a piece of paper and pitched it, to huge acclaim and success. Bakabon has four members in his family, counting him, while Homer’s has five, including our loveable patriarch. Lisa and Maggie could be combined to create Hajime-chan, but still, it’s ONE OFF, but that doesn’t mean it’s bad. Papa is on a whole other level of stupid than Homer. He can bend the universe to his will to fit a joke, while Homer is just a dad who works the 9-to-5 and can tolerate extreme pain (ie Homer Simpson Syndrome). Unstoppable Force vs. Immovable Object would be a good comparison for the two. Papa, who frequently gets in trouble with the law and Honkan-san (Omawari-san, Mr. Policeman), can’t be said the same for Homer, who hasn’t much rivalry with Chief Wiggum or his corps. The style of humor is very much different from The Simpsons and Tensai Bakabon: Bakabon exploits gags and plots to the benefit of its characters, while The Simpsons pokes fun at its surroundings by using the characters in them, with parodies and referential comedy. In short, Bakabon and Simpsons are two different shows, and even though Fujio Akatsuka is the king of gag manga, it doesn’t necessarily mean that all comedic geniuses share the same formula. Charles Brubaker is a cartoonist originally from Japan. 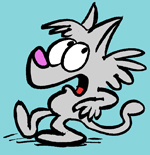 In addition to his work for MAD Magazine and SpongeBob Comics, he also created Ask a Cat for GoComics . You can also follow him on his Tumblr page.